One of my favorite appetizers is deviled eggs. These two bite (or one big bite) treats are the perfect mini snack for any type of gathering. However, since my old version of deviled eggs isn’t exactly paleo I had to come up with a new version for my go-to appetizer this year. Since I haven’t quite perfected my own paleo mayonnaise yet, I decided to use an avocado for the creamy addition to make these mayo free deviled eggs. Oh boy was that a good idea. Topping them off with some crispy prosciutto? Now that’s just downright indulgent. 2. Line a baking sheet with parchment paper. Lay out the prosciutto on the parchment paper and place it in the oven to broil for approximately 5 minutes, until it’s browned and crispy. Be careful not to burn it. Remove from oven and allow to cool. 3. Cut each hard boiled in half. Scoop out the yolk into a medium bowl. Place the empty egg halves on a serving platter or plate. 4. Cut the avocado in half and scoop out the insides into the bowl. Add in the garlic powder, onion powder and mustard. 5. Mix everything together with a mixer, whisk or fork. You want to mix it well to form a creamy texture. Add salt and pepper to taste. 6. Next, scoop the egg and avocado mixture into the egg halves. Heap up each egg half with the mixture until you’ve filled every egg half up and used all of the mixture. Sprinkle the eggs with smoked paprika if you'd like. 7. Finally, break up the prosciutto into small pieces and place some crumbles on each deviled egg. 8. 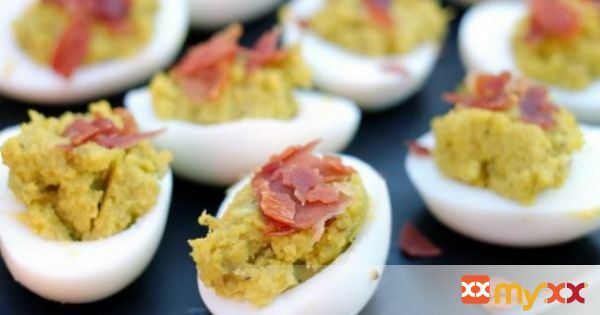 Serve these mayo free deviled eggs to your hungry guests!